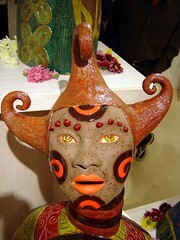 This is one of several amazing beautiful ceramic sculptures created by my good friend Sharon. She’s raising money through the sale of these pieces to fund an arts center in Mozambique. If you’re in San Francisco, check out her show at Ruby’s Clay Studio, 552A Noe Street @ 18th. It runs until March 1st.